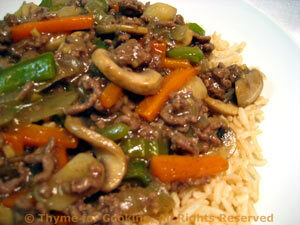 Thyme for Cooking Dinner tonight: Oriental Beef on Brown Rice. Who says you can't make a Chinese dinner with ground beef? It's economical, quick and tasty... even if it's not authentic. Use whatever mushrooms are left from Friday.